Here's some help when choosing what to splurge on in your new home. Designing a custom home is exciting. You get to create your dream home with all of the features and styles you like best. Are you wondering which areas are worth splurging on? It really depends on you and your family and what your top priorities are. But if you want to make the best decisions for resale value, some are more likely to be worth the investment. 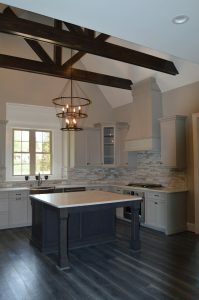 Here are the top 5 areas to splurge on according to some of the best home builders in Greensboro. Kitchen. Hands down, this is the most important room of your home. It’s where you cook, eat, congregate, entertain, and more. Even during parties it seems everyone ends up in the kitchen. You’ll need more space than you think. You’ll need more storage than you think. You may even need more appliances than you think, like a second oven or cooktop. Design your kitchen to be functional as well as beautiful. Choose durable countertop materials that are also stylish. Carefully consider the flooring material in your kitchen, as it will get wet more often than other areas of your home. Tile is extremely durable and moisture resistant. Hardwood floors are not. Most importantly, make the kitchen a room you will enjoy. Lighting. It is important to design a lighting scheme that is both beautiful and functional. It is much more difficult to add lighting after the home is built. Plan accordingly so that you’ll have plenty of light in all the areas where quality lighting is needed. Splurge on the ornamental pendant lights you want for the dining room and the elaborate chandelier for the foyer. It will be worth it. Storage. This may seem like less of a splurge, but it is incredibly important. Storage space seems to be an issue for most households. Storage units as a business are booming for this exact reason. Build in enough storage in your home and skip the extra expense of storage units outside the home. When it comes to resale, potential buyers will love the abundant storage. Garage. Besides just their cars, there are many other things that people tend to store in their garage. Mowers, lawn equipment, gardening tools, bicycles, sporting equipment, golf carts, and more will probably live in the garage. If you have a boat or camper, storing them in a garage keeps them in better condition. Splurge on a garage that is spacious enough to house all of your vehicles and equipment. Outdoor Space. Don’t forget about the outside of your home. If you like to spend time outdoors or plan to entertain, having a back patio, deck, or screened in porch is an amazing addition to your home. Outdoor kitchens are convenient for grilling, frying, or smoking foods and are often equipped with sinks and refrigerators so you can do it all from outside. R&K Custom Homes wants you to have the home of your dreams, whatever that means to you. Don’t be afraid to splurge on the items you really want. This is your place and it should be everything you’ve always wanted. Call the best home builders in Greensboro, R&K Custom Homes, today: (336) 643-3503.